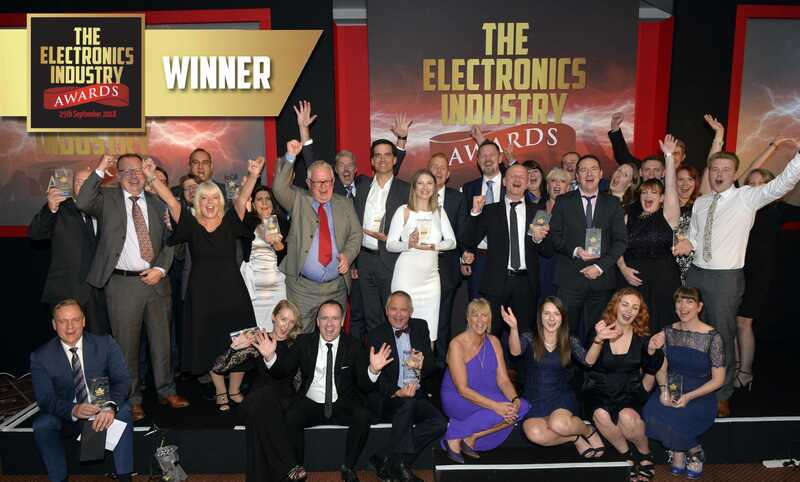 The atmosphere was electric at Birmingham’s National Conference Centre on Tuesday 25 September, as the very best from across the sector gathered for the premier edition of the Electronics Industry Awards. Launched earlier this year by Datateam Business Media, in association with CIE Magazine, Electronics Magazine and ecsn, the scheme immediately garnered praise for its unique take on an awards programme – which placed the power in the hands of the very industry that it serves. Following a huge influx of entries, professionals from across the electronics sector were invited to select the very best products, companies and people in an online vote. The reins were handed over to the evening’s host, critically-acclaimed comedian Sean Collins, to reveal who had received the highest number of votes in each category – and ultimately, who would be among the first inducted into the Electronics Industry Awards’ ‘Hall of Fame’. The night’s presentations began with the ‘product’ awards. The first to be presented, Aerospace/Military/Defence Product of the Year, went to Blakell Europlacer Ltd for the Europlacer Atom 3. Blakell Europlacer Ltd was the only company to take home multiple trophies on the night, later picking up the award for Best Customer Service. Socionext’s integrated Human Machine Interface was next to be honoured, picking up the title of Automotive Product of the Year, before Fujitsu Components Europe was presented with the Display Product of the Year accolade for its Multi light touch series touch panel. Enclosure Product of the Year went to Phoenix Contact Ltd for the ICS (Industrial Case System), Microchip’s MPLAB® PICkit™ 4 was chosen as the Engineering Development/Design Product of the Year and Intelliconnect’s Solderless 2.9mm connector was cited as the Interconnection Product of the Year. Cypress collected the Internet of Things Product of the Year award for the 32-bit Arm® Cortex®-M4 PSoC® 6, before Powerbox International AB was presented with the Power Product of the Year accolade for its Coreless GB350 medical power. The Test, Measurement & Inspection Product of the Year title went to ERS electronic GmbH and MPI Corporation for the AirCool PRIME, and the final product award of the evening – Embedded Solution Product of the Year – was presented to Xilinx for the Zynq UltraScale+ RFSoC. The focus of the evening then shifted to the company awards, commencing with the hotly-contested Distributor of the Year accolade – with the industry’s choice being revealed as Farnell element14. M-TEK then picked up the title of Electronics Manufacturer of the Year, Mouser Electronics was presented with the Excellence in Innovation award and the Environmental Leadership accolade was picked up by NCAB Group UK Ltd.
RS Components was recognised with the Academic Support Award, before the penultimate award of the evening – Most Outstanding PR Agency – was presented to Napier Partnership Limited. The awards presentation concluded with the coveted Industry Personality award, which was presented to Debbie Wade of Advanced Rework Technology Ltd. The Electronics Industry Awards also provided guests with an opportunity to give a little back, in the form of a charity fundraiser in aid of Birmingham Children’s Hospital, a charity nominated by sponsor Analog Devices, which strives to give over 90,000 sick kids the best possible treatment, care and experience during their time in hospital. Generous donations were made by all in attendance, with the total sum raised to be revealed in due course. With the huge success of the inaugural Electronics Industry Awards, its organisers were keen to thank the companies that pledged their support to the scheme: headline sponsor Astute, Analog Devices, BWW Communications, Farnell element14, IntelliConnect, Napier, Mouser Electronics, Socionext, What’s New In Electronics and Electronic Components Supply Network. To find out more about the Electronics Industry Awards and to view the full gallery of photos from the night, visit www.electronicsindustryawards.co.uk. The Electronics Industry Awards – Finalists revealed! Celebrations & donations!